A direct object is a noun, whether person or thing, that someone or something acts upon. In the simplest sentences, the direct object directly follows the verb, so it’s very easy to see the effect that the verb has on the noun. Elle connaît Grégoire. She knows Grégoire. Je vois le chiot. I see the puppy. Je lis un roman historique. I’m reading a historical novel. Can always be found by asking "Whom?" or "What?" Whom does she know? She knows Grégoire. What do I see? I see the puppy. What am I reading? I’m reading a historical novel. 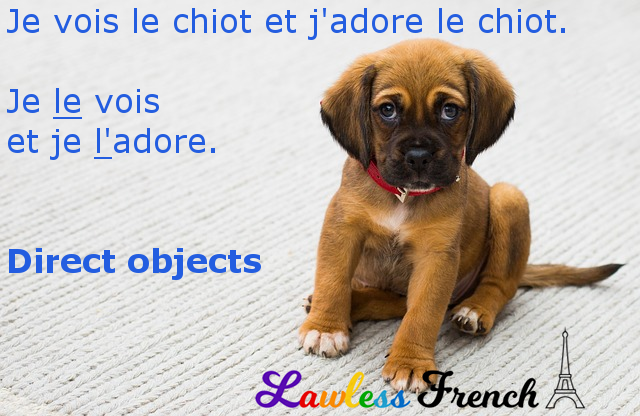 In order to avoid repeating nouns in a series of sentences or when answering questions, both French and English replace direct objects with direct object pronouns. Elle voit Grégoire. Elle connaît Grégoire depuis 2 ans. She sees Grégoire. She’s known Grégoire for 2 years. Elle voit Grégoire. Elle le connaît depuis 2 ans. She sees Grégoire. She’s known him for 2 years. Le replaces any masculine noun, whether human or inanimate, while la replaces any feminine noun. + The plural direct object pronouns have just one form each. In French, direct object pronouns generally precede the verb, whereas in English they follow it – learn more. Je le connais. I know him. Nous la buvons. We’re drinking it. Tu m’aimes ? 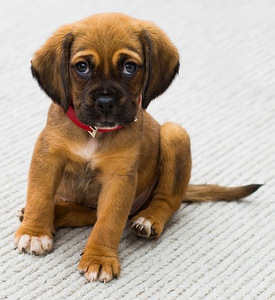 Do you love me? Elles vous voient. They see you. In compound tenses like the passé composé, direct object pronouns precede the auxiliary verb. Je l’ai dit. I said it. Nous t’avons vu. We saw you. With semi-auxiliary verbs, direct object pronouns precede the infinitive. Je dois le dire. I have to say it. Nous pouvons te voir. We can see you. Je le conais. x Je veux le connaître OR je le veux connaître. which one is right? Je veux le connaître is correct.